We match you with the best mortgage for your needs. Making your home buying experience simple and easy is what we do best. Our mortgage experts are here to provide answers to your questions and guide you through the process with ease, from prequalification to closing. We believe that buying a home doesn’t have to be overwhelming when you have the right information and support to help match your mortgage to your needs. Getting pre-approved for a mortgage loan lets sellers know you’re a serious buyer. When you get pre-approved, you’ll get an estimate of a loan amount you may qualify for and a price range you may want to consider. During the pre-approval process, we check your income, employment, credit, and account—and it’s fast and easy! Get started today through the mortgage loan application, and just select the Pre-Approval option. One of the perks of being a Signal member is having access to the HomeAdvantage Program. With HomeAdvantage, you can find a real estate agent, search for homes, and earn cash rewards3. Make your home buying process easier with HomeAdvantage. Need more information or want to schedule a free consultation? Call 301-363-2840 or fill out the form below and a mortgage matchmaker will be in touch. * Best time for us to call you? * When do you plan to purchase a new home? * Are you currently a Signal Financial FCU Member? * Are you currently working with a real estate agent? By submitting this request, I consent and agree to communications from Signal Financial FCU. I understand that I can opt out of communication at any time. 1 Not all applicants will qualify for the lowest rate and not all applicants will qualify for the First-Time Homebuyer Program. Please contact a mortgage loan officer at 301-933-9100 ext. 104 about applicable rates and offers. 3 The HomeAdvantage program is made available to you through a relationship between Signal Financial Federal Credit Union and CU Realty Services. Program Cash Rewards are awarded by CU Realty Services to buyers and sellers who select and use a real estate agent in the HomeAdvantage network. Home buyers or sellers are not eligible for Cash Rewards if they use an agent outside this network. Using Signal Financial Federal Credit Union for a mortgage is not a requirement to earn Cash Rewards. Cash Rewards amounts are dependent on the commissions paid to the agent. Signal Financial Federal Credit Union may have specific rules on how your Cash Rewards will be paid out. Cash Rewards incentives are available in most states; however, are void where prohibited by law or by the lender. Please consult with your credit union to get details that may affect you. 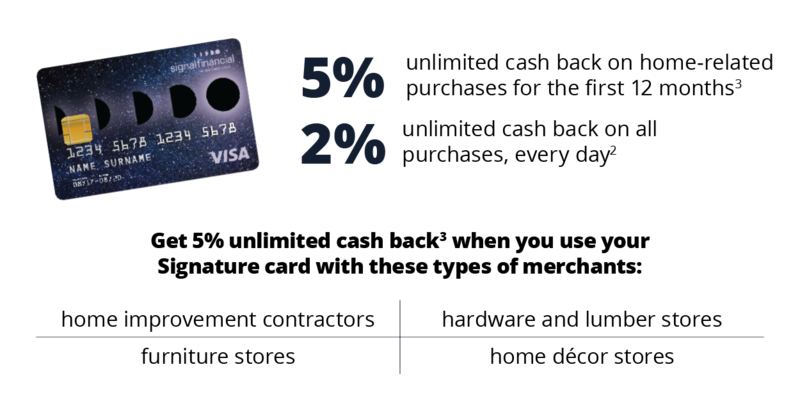 4 Promotional 5% cash back offer available on new Signal Financial FCU Signature Visa credit cards for the 12 months after card activation. For existing cardholders, 5% cash back offer is available from April 8, 2019 to April 7, 2020. After 12 months, cash back returns to the standard cash back rate of 2% for all purchases. 5% cash back will be credited to the member’s credit card account for purchases made at qualifying merchants in the categories of home improvement, home decor, and home repair. Member must meet credit guidelines to be approved for the Signature Visa credit card. Cash back benefits apply only to purchases made with the member’s Signature Visa credit card. Member must be in good standing to receive cash back benefits. Cash back will be removed from the member’s account if the qualifying purchase is returned/refunded. Visit signalfinancialfcu.org/signaturevisa for more details.